Just for fun I entered the CQ WW WPX contest. I was getting enthusiast for this phone contest by my fellow bloggers who work with phone most of the time. This is the second time that I participate in a contest in phone. As a QRPp enthusiast I participated in many contests in CW using the lowest possible power. Even when I prepared for the contest, I noticed that I only had worked CW in the past. I had to program VFOb of the FT-817 for the SSB segments of the 40 m, 20 m and 15 m band. I started on 15 m. My power is 2.7 watts and the antenna is an Inverted Vee. After 6 QSO we went shopping. I was very curious how it would go in this phone contest. But now I found out, that just as with CW with very low power, the signals in phone also have to be S9 or better. 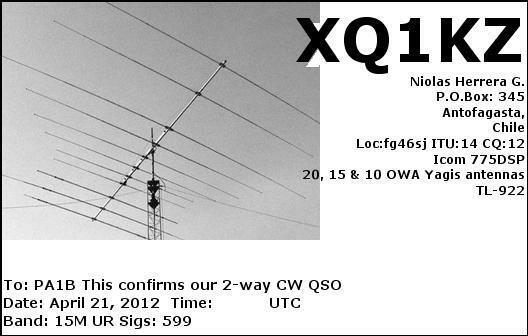 Recently I received an eQSL from Nicolas XQ1KZ from Chili for a more than 1000 MPW QSO. We made the QSO in the CQ MM DX contest in 2012. The distance is 6910 Miles. With 2.7 Watts this gives 2559 Miles per Watt. I used an Inverted Vee. 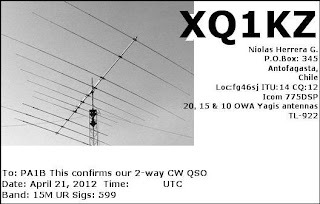 Thanks to Nicolas XQ1KZ for a new DXCC in QRP. Last week I wrote a small pile of 60 QSL cards. Almost all of the cards were for QSO's with more than 1000 Miles per Watt. The used power in the QSO's was 2.7 Watts down to 1.8 milliwatt. While I was writing the cards, I took up the plan to take a photograph of one of the many "more than 1000 Miles per Watt QSL cards" that I was writing, just to show how I present the "1000 MPW info" on my a card. Actually I was going to photograph the QSL card, that I would send to LZ6C for a QSO with 1.8 mW. For this QSO I calculated 559091 Miles per Watt. At the top of the card I give the power catatgory: QRP, QRPp or QRPpp. The FT-817 can be adjusted to 5 W, 2.5 W, 1 W or 500 mW, so I encircle the used power. Well, after a serious mismatch the power of my FT-817 is 360 mW when adjusted to 500 mW, so I write 360 mW above the FT-817. Since I used the 10 dB attenuator, I encircled the value 10 dB in the attenuator. The most important value is the power to the antenna. Here 36 milliwatts. My locator is JO22na. The locator of LZ6C is KN13ot. Using both the locators, I calculated the distance and the Miles per Watt, with the excellent (Click) N9SSA Distance and MPW Calculator. The distance is 1006 Miles and 27955 Miles per Watt. Thanks to the Radio Club Silpa with their Excellent Ears. Go to the WSPR Database to see what is possible with very low power with WSPR. First choose the band of interest. Reverse the order to find the low power spots. You can see more than 50 spots. Maximum number of spots is 20000. hi. is 1 milliwatt, which is 0 dBm. Please ignore all the spots with less than 1 mW. The table below shows spots for 1 mW. (+0 dBm) The short table below shows spots that were made with the 1 milliwatt. The signals have traveled a considerable distance. In this table all the received signals are "solid copy", since all the signals are received with a SNR of -29 dB or more. The higher the SNR, the stronger the signal. For more info on this calculation, please click on: Calculated lowest possible power in a WSPR spot. or SSB with 100 to 400 milliwatt. We hadden de kleindochters te logeren. Vanmorgen wilden ze het knuppelpad lopen op het landgoed Oostbroek. Op weg er naar toe, viel het niet eens op dat het licht gesneeuw had. Maar het was prachtig met de sneeuw. Al vonden ze het wel heel koud. The Black Sea Cup International is nice contest that is organized by the BSCC. In just two hours I made 25 QSO's with the lowest possible power. SOAPBOX: Used an attenuator for very low power. Hi. SOAPBOX: Thank you for the activity in the contest. Bas PE4BAS asked me about the difference in power of WSPR compared to SSB. In various publications, the difference between SSB and CW, is given as 13 dB. Or somewhere between 15 dB and 11 dB. difference between SSB and WSPR is 13 + 13 = 26 dB or 20 x 20 = 400 in power. So 400 W in SSB can be compared with 1 W in WSPR. For an advantage of 26 dB, the power in WSPR can be 1/400th of the power in SSB or 1/20th of the power in CW. This means that the power in WSPR, must be much lower, than the power used in SSB. My choice for a value of 26 dB is just a guideline to choose your power in WSPR. If you use a speech processor, you can use a lower value than 26 dB. E.g. 22 dB. So you can use WSPR for a propagation analysis, to see what is possible with your SSB station. A power of 80 Watts in SSB or 4 W in CW, can be compared with a power of 200 mW in WSPR. If you want to know where your SSB QRP signal of 4 Watts will be received, you should use a power of 10 mW in WSPR. As a CW enthusiast you can use WSPR spots made with 20 mW or 50 mW to analyse with WSPR where your CW signal of 400 mW to 1 Watt can be heard. Looking back, after nearly two weeks, I am still confused by the great results. I made much more QSO's, than I expected. I worked much more states. I had programmed the Morse Machine for two different reports. For QRP: 599 003 003 for QSO's with 2.7 Watts and 599 001 001 for QSO's with 800 mW or less. Further I programmed a button to give my power instandly, 3W 3W, if any one should ask my power. I did not start early. per hour for 3 1/2 hour. After 3 1/2 hours I had 30 QSO's in the Log. to 12 QSO's per hour. On Sunday I first made some QSO's on 21 MHz. When I went to 28 MHz, there were not that many stations on the band. so I continuously met stations, that I had worked before on 14 and 21 MHz. At first with 12 QSO's in a hour and later with 16 QSO's per hour. When 28 MHz closed there were about 150 QSO's logged. After some more QSO's on 14 MHz and 21 MHz, the final number of QSO's is 162. I programmed the Morse Machine to give the 003 twice in each QSO. In 9 QSO's I used 800 mW and in 7 QSO's I used 360 mW. For these QSO's, I gave an exchange 5NN TT1 TT1. In all most other contests, I use the lowest possible power in each QSO. But in this contest, I only reduced my power, when the signals were much stronger than usual and only when the station was calling CQ continuously. So I did not make that many QRPp QSO's. The exchange 599 003 can be an confusing experience. Just for fun I kept note, of the times, that I had to repeat or explain my exchange. On Saturday I had to repeat in 8 QSO's on 21 MHz and later in only 2 QSO's on 14 MHz. On Sunday I had to repeat my exchange only in 3 QSO's. My antenna is an Inverted Vee for 40 meters. which also works very well on higher frequencies.